The government is likely to reduce the import duty on gold and ease restrictions on the gems and jewelry sector in the budget on July 10. There are indications that the budget can announce a marginal cut in duties to prevent a sudden surge in imports. Gold duty has been raised to 10 per cent from 4 per cent. The government is also keeping a close eye on the developments in Iraq. A senior finance ministry official said the rise in global crude oil prices following the unrest in Iraq was unlikely to stall the move to cut duties. “There have been discussions on Iraq and the spike in crude price. The current account deficit (CAD) will be very much in control this fiscal,” the official said, indicating the assessment of the government on the current geopolitical situation and its impact on the economy. If the unrest in Iraq escalates, it can push up crude oil prices, resulting in higher diesel and fuel rates. Besides, the high oil import bill will result in dollar outflows and hurt the rupee’s value and the current account deficit (CAD). According to some estimates, even if the crude prices move up to $120-$125 (the worst-case scenario), CAD will still be below 3 per cent of GDP (gross domestic product) in 2014-15. CAD had dropped sharply to 1.7 per cent of GDP, or $32.4 billion, in 2013-14, on the back of plunging gold imports. Analysts said the below-normal monsoon could also weaken demand as much of the yellow metal is purchased by farmers. “If crop production is lower because of poor monsoon, it will mean less money for farmers to put towards gold purchases. Already the demand is subdued because of high duties. There are hopes that the government may relax those duties, but if the farmer income falls because of a poor harvest, it is possible gold demand may not get much of a bounce,” analysts said. 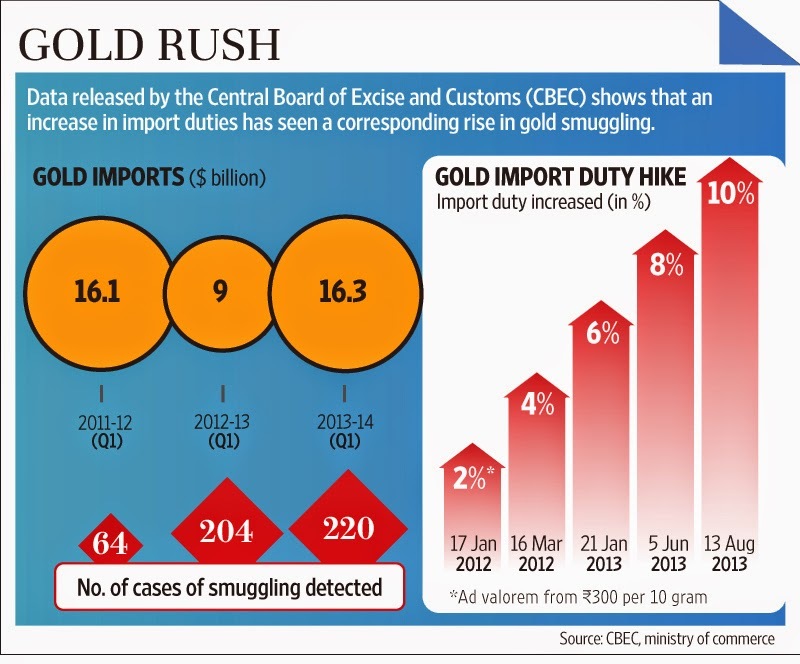 “Going forward, we expect some widening of trade deficit on the back of gold demand picking up on expectation of a reduction in import duties. However, the extent of trade gap is unlikely to be worrisome as we expect exports to maintain good performance,” Yes Bank chief economist Shubhada Rao said. The government is also set to ease the 80:20 scheme for the gems and jewellery sector. Under the scheme, nominated agencies are allowed to import gold on the condition that 20 per cent of the inward shipment will be exported. Gems and jewellery exports account for about 15 per cent of India’s total outbound shipments and exporters have been urging the government to lift the import curbs. The gold price added $3 to end at $1,320 on Friday, making it the third straight week of gains for the precious metal. Gold's $50 an ounce surge on June 19 startled what had been a sleepy market forcing the smart money to play catch up. 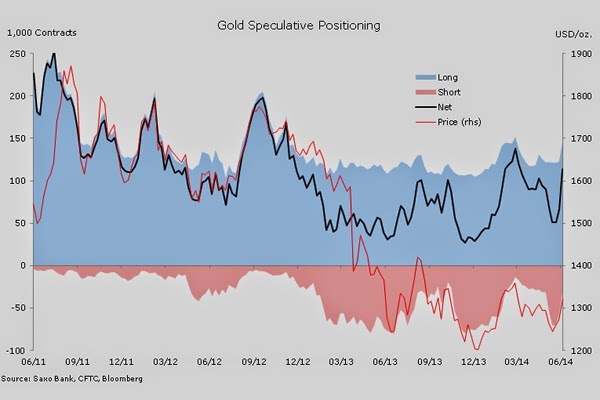 Data released after the close on Friday showed hedge funds and other large gold investors adding a record amount of ounces to their bullish positions. According to Commodity Futures Trading Commission data bearish or short positions held by so-called managed money fell by nearly 25,000 contracts in the week to June 24. 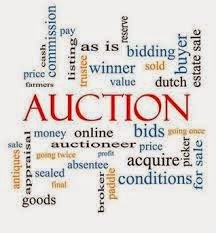 Speculators added almost the same number bullish or long positions – bets that the price will go up – translating into a 61% net gain of 47,784 contracts or 4.8 million ounces. This is probably the biggest weekly increase on record or at least since 2007 when the CFTC changed the way data is collected says Ole Hansen, head of commodity strategy at Saxo Bank. Significantly, it is also the the first time during the recent rally the increase was not only driven by short covering but also the addition of new longs, according to the Danish bank. On a net basis hedge funds now own net longs of over 120,000 lots or 12.1 million ounces, levels last seen in March when gold hit its 2014 high of $1,380. Managed money is also moving heavily into silver with net longs increasing almost four-fold by 19,623 contracts to 24,757 almost equaling the February high of 25,090 contracts, CFTC data shows. Precious metals have outperformed other commodities this year with double digit gains for palladium and gold and a strong performance for platinum and silver. The positive momentum may now be spilling over to other sectors. "When asked 'What do you expect your level of investment to be over the coming 12 months? ', 42% of respondents said 'overweight,'" – up sharply from the 19 percent who expressed such optimism in 2013 according to Credit Suisse. With US equity markets hovering near record-er highs, we thought a quick summary of the state of the world's growing geopolitical risks would 'help' rationalize the BTFATH mentality. 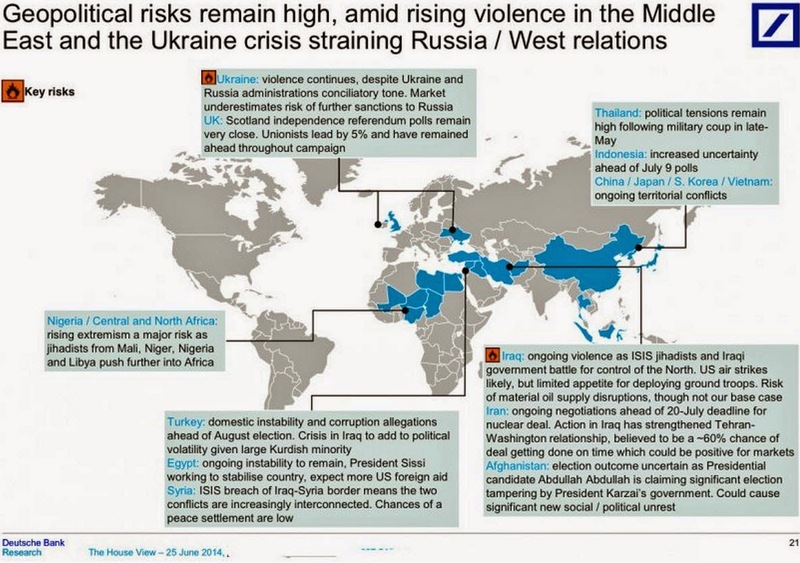 Here is Deutsche Bank's map of the most potentially destabilizing risks around the world.. The data released by the General Administration of Customs indicates that the imports of primary aluminum grew significantly during the month of May this year. On the other hand, the imports of waste aluminum by the country dropped during the month. The country’s imports of primary aluminum totaled 24,049 tons during the month of May ’14. The monthly output rose 10.23% upon comparison with the output during the same month a year ago. The Chinese welded steel pipe imports had totaled 21,817 tons in May 2013. As per Customs data, the country’s average import price of primary aluminum averaged at $ 2,026.78 per ton during the month of May. The cumulative primary aluminum import by the country during the initial five months of the year totaled 212,484 tons, 162.11% higher when compared with the output during the corresponding five months during the previous year. The January-May primary aluminum imports had totaled 81,067 tons during 2013. China imported 169,583 tons of waste aluminum during the month of May this year, falling by nearly 15% year-on-year. The cumulative imports of waste aluminum during the first five months of the year totaled 929,516 tons, marginally lower by 1.85% when compared with the imports during the corresponding five months in 2013. The latest statistics released by the country’s General Administration of Customs indicates that the Chinese refined copper imports surged higher during the month of May this year. The country imported 282,969 tons of refined copper during the month. The imports during May ’14 were 21.89% higher when compared with the imports during the same month a year ago. The average import price for refined copper during May ’14 was $ 6,925.74 per ton. The refined copper imports by the country during the initial five-month period of the year totaled 1.63 million tons, rising significantly over the previous year. The imports jumped 48.84% higher when compared with the imports during the corresponding five-month period during 2013. The Chinese refined copper imports during January to May in 2013 had totaled 1.10 million tons. Meanwhile, the country’s refined copper exports soared higher during May this year. According to Customs data, the exports of refined copper during the month totaled 28,149 tons, nearly 95% higher when compared with the exports during May last year. The cumulative refined copper exports during the five-month period of the year totaled 105,204 tons, down 37.58% over the previous year. YOU WILL GET LIVE L.M.E. PRICE DIRECT FROM LONDON METAL EXCHANGE VIA JP MORGAN SITE WITH LARGER SPREAD. "Markets don't appreciate how close the Fed is to its goals," and thus tightening is the warning from the usually quite dovish Jim Bullard. Remember, don't fight the fed - unless they say sell? And it seems the market that is 'wrong' is stocks; as bond yields continue to tumble to 4-week lows. Consider for a moment the many reasons why bonds would be here and now thanks to Bullard, they are front-running the equity sell-off (knowing that once stocks dump, it will all go into duration). Restocking and improved demand for industrial base metals is likely, said TD Securities. “With China growing at 7.5%, the U.S. showing more and more positive data points and Europe benefitting from more ECB (European Central Bank) monetary accommodation, industrial metals demand should tighten their supply/fundamentals across the base metals complex into 2014,” said TDS says. Chinese inventories of products containing metals have been declining, and they may need to be replenished should industrial uptake speed up. “It is quite likely that manufacturers are light on inventories owing to recent uncertainty related to Chinese growth,” TDS added. “We are also hearing the same thing from Western world manufacturers. Metals with supply constraints, like zinc, are likely to perform best. 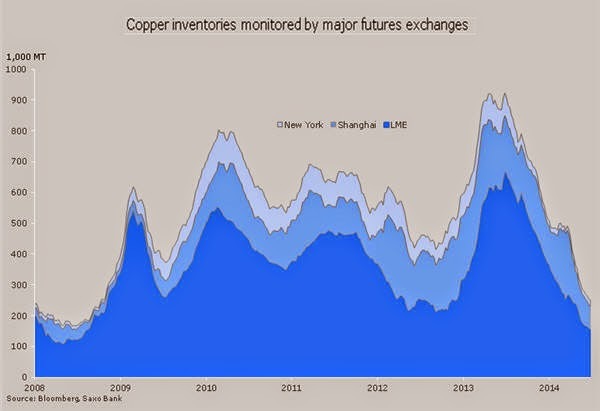 While the scandal surrounding copper in China may have some negative impact, it is small relative to the market and should not skew the positive impact of global supply/demand physical fundamentals and cost structures,” TDS added. In New York trade on Monday September copper extending a rally to reach a high of $3.1765, sparked by a continuing drawdown of inventories around the world. It's the tenth straight day of gains for the red metal after coming dangerously close to breaching the $3.00 a pound level at the start of June for the second time this year. The rally is the longest winning streak for the metal since 2005. LME copper also showed some strength climbing to $6,955 a tonne. Gains for copper come on the back renewed optimism about more robust global economic growth after strong manufacturing numbers out of China and expectations of an acceleration in the US economic recovery. The copper price is highly correlated with economic growth thanks to the widespread use of the metal in the construction, transport and power industries. Inventories at warehouses managed by the LME and those in New York and Shanghai, fell to a six-year low on Thursday – 50% in 2014. The global refined copper market swung to a surprise shortage in March and a 205,000 tonnes deficit for the first three months of the year, compared with a 206,000 tonnes surplus in the same period in 2013, preliminary data from the International Copper Study Group showed on Monday. Defying market expectations, the copper price has dug itself out of a near four-year low struck mid-March of $2.92 a pound. The metal remains 5.7% down in 2014 as the market adjusts to slower growth in China which consumes more than 40% of the world's copper demand of some 21 million tonnes. A complicating factor in predicting the copper market this year is Beijing's crackdown on the use of commodities as collateral for letters of credit. On Thursday it was revealed authorities uncovered massive fraud in the China's gold-backed loan industry, which comes on the heels of a probe into allegations that several companies pledged the same copper, iron ore and other industrial metals held at the port of Qingdao as collateral for loans to different banks. Fears that these stocks will be dumped onto the market as these deals unwind forcing prices down and creating a vicious circle have spooked the industry, especially iron ore. In sharp contrast to copper Chinese iron ore inventories remain close to record highs of 115 million tonnes and the price of the commodity is already down some 30% this year. "The Qingdao issue is raising concern over the status of supplies, with physical copper in Shanghai now commanding a premium over front-month futures, having been trading at a discount earlier this month. "Another potential impact from Qingdao is that Chinese imports of metals will decline in coming months, as traders find themselves shut off from letters of credit." Chinese copper imports tumbled 16% in May compared to the previous month, but year to date China is still importing refined copper at a record setting pace – up a whopping 34% over 2013 to 2.1 million tonnes. Other base metals have also enjoyed a good run. Zinc was trading near a 16-month high at $2,190 a tonne, as LME stock of the metal sink to lows last seen in 2010. The base metal is up more than 6% during the current quarter. Lead has advanced 5% this year and is now back to highs last seen in February this year above $2,150 a tonne. The imminent closure of several lead-zinc mines including the Century mine in Australia have raised fears of a supply shortage. Nickel continues to be the strongest performer gaining 13% just over the last three months in response to Indonesia’s export ban on unrefined mineral ores. Nickel prices scaled $21,000 a tonne in May, but has since settled back to the mid-$1,800s. The Ukrainian crisis also underpinned the price of the steelmaking raw material over fears of increased sanctions against Russia – Norilsk accounts for approximately 17% of global nickel output. Tin is the laggard of the sector trading close to its opening levels of 2014 at $22,425 per tonne. Tin has followed the opposite path to copper. Expectations was for a rise in the price on predictions of a market deficit, but warehoused stock has been on a rising trend reaching 11,185 tonnes on Thursday, up nearly 40% over the past four months. Alcoa Inc, the company that helped create the aluminum industry more than a century ago, is reinventing itself as a manufacturer of specialized components for aerospace and automotive customers, including some that contain no aluminum at all. The company's deal for jet engine part maker Firth Rixson, which uses little aluminum, is its biggest move yet to escape the terrible primary aluminum market by crafting the parts its customers need, even if they are made of nickel or titanium. It announced the proposed $2.85 billion deal to buy Firth Rixson earlier on Thursday. Alcoa talks constantly about expanding its downstream businesses, which sell truck wheels, aircraft parts and other goods. Now it is rebranding itself in ways that would have seemed unthinkable just a few years ago. "We are really material-agnostic," Chief Executive Officer Klaus Kleinfeld said in an interview on Thursday. "We love, internally, that we have fights over what is the right material, in front of our customers, together with our customers." From an upstart, this would be one thing. But Alcoa has been synonymous with aluminum since 1888, and it has a role in every part of the sector: mining bauxite, refining it into alumina and smelting alumina to create aluminum. And yet in retrospect, Thursday's deal is not the first sign of a shift into other metals. Aerospace, which accounted for 17 percent of revenue last year, is already dominated by nickel-based alloys and titanium, as well as aluminum-lithium alloys. 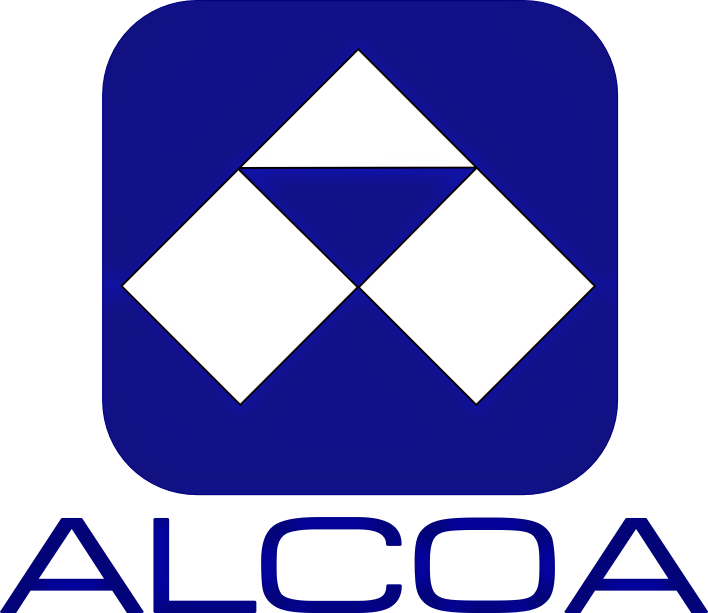 In January, Alcoa quietly revised the company description that appears in its news releases. Instead of "the world's leading producer of primary and fabricated aluminum," it now introduces itself as "a global leader in lightweight metals engineering and manufacturing." Last week it said it would invest $25 million in Hampton, Virginia, to produce largely nickel-based alloy jet engine blades. In May, it broke ground on a $100 million facility in Indiana to make nickel-based alloy engine parts. Investors are not complaining. Alcoa's stock has been climbing more or less steadily since late last year, and is up more than 80 percent from a year ago. "I think it's a good thing," said Tim Ghriskey, chief investment officer of Solaris Group, referring to the Firth Rixson deal. "It makes aerospace a bigger part of Alcoa, and to us it's a business with a wide moat." Ghriskey also said the deal would diversify Alcoa, and that was likely boosting the stock. Shares closed up 2.7 percent at $14.94 on Thursday. Aerospace has long been a key market for aluminum producers, but Alcoa and its rivals are also expanding in the U.S. automotive industry, once virtually owned by the steelmakers. That battle came up often at last week's Steel Success conference in New York. At one point an audience member asked Lakshmi Mittal, chief executive of top steelmaker ArcelorMittal SA, why he would not just buy an aluminum producer. The audience laughed. "You can also tell aluminum companies that steel is a better solution. They should buy steel companies," Mittal said, to applause. The next questioner changed the subject. But in the face of low prices and excess capacity, steelmakers should also consider diversifying into other materials, said John Lichtenstein, Accenture's global managing director for metals. "There's sort of the mindset of, zero sum, winner take all, in the automotive war in particular," he said. But automakers have told him they want suppliers to look at the entire vehicle, to help work out the best mix of materials and solve technical problems like how best to join them together. The Firth Rixson deal is sure to revive the debate over whether Alcoa should remain vertically integrated, or break itself up as rival Alcan did in 2005, when it spun out Novelis, which makes aluminum sheet for beverage cans and cars. Asked about a spin-off, CEO Kleinfeld said Alcoa is well-positioned right now, and pointed to the higher-cost smelters it has shut down in the last few years, as well as its joint venture in Saudi Arabia, which is expected to boast low operating costs once it has ramped up. "We've come down substantially on the cost curve. We will continue to come down," he said. But he added the company is always looking at its portfolio. In general, Lichtenstein said, vertical integration can benefit aluminum companies that have access to high quality bauxite, which is in tighter supply, than, for example, iron ore, used to make steel. Zinc has surged 12% in the past 2 months. The metal might reach a 3-year high soon, and that could finally allow Zinc prices to increase to new levels. 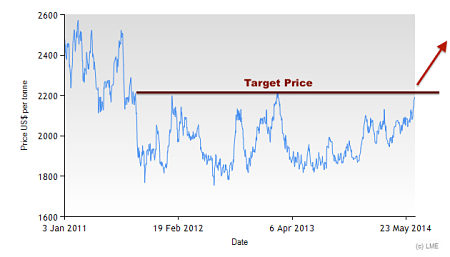 As we commented 2 weeks ago, the metal was showing a bullish technical pattern and we would expect it to keep going up. The fundamental picture supports a bullish attitude. Demand is expected to keep growing for the coming years, while the looming closure of major mines such as Century in Australia and Lisheen in Ireland next year due to mineral depletion, has most analysts predicting the deficit of this year only getting worse in the years to come. In the meantime, mining companies have been slow to open new zinc mines and LME stocks fell last week to a three-year low. Commodities and, in particular, base metals have been in a falling market since the spring of 2011 and that’s also a reason why zinc hasn’t been able to turn its price around ever since. However, commodities made a key upward move this year and some industrial metals have already started to show some life. 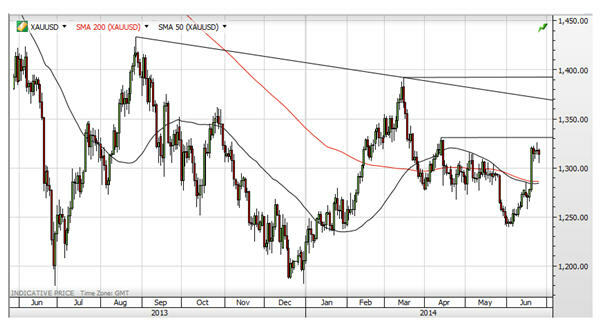 A further recovery in commodities and the metals sector will definitely help zinc on its way up. We have seen many times that prices can move in the opposite direction of what the fundamental picture is saying. This is because many of these fundamentals are already discounted in the price and that is why, despite of having a fundamental opinion of the future, you should always wait for price actions before making purchasing decisions. Zinc is at its highest level since February 2013 and chances are that it breaks to a new three-year high. The fundamental and technical pictures are pointing to higher prices. If zinc manages to push onto new ground, we recommend buyers take their risk off the table and start taking long-term positions as prices will likely trend upward. Zinc rose, trading near a 16-month high, as inventories in warehouses tracked by the London Metal Exchange declined amid signs of improving demand. Stockpiles fell for a fourth session, extending a slide to the lowest since December 2010. Zinc, used in everything from brass plumbing fixtures to steel car parts, has gained 10 percent this quarter amid signs of recoveries in manufacturing and housing. U.S. new-home sales posted the biggest one-month gain since 1992 in May, while American factories received more orders for business equipment, government data showed this week. 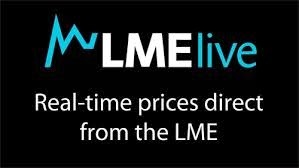 Zinc for delivery in three months climbed 0.4 percent to settle at $2,190.50 a metric ton by 5:50 p.m. on the LME, after reaching $2,195.50. On June 23, prices climbed to $2,198, the highest since Feb. 15, 2013. Copper for delivery in three months rose 0.6 percent to $6,955 a ton ($3.15 a pound) on the LME. 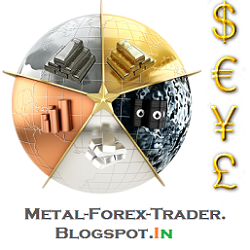 On the Comex in New York, copper futures for delivery in September gained 0.2 percent to $3.172 a pound. Prices advanced for a 10th session, the longest rally since June 2005. Inventories monitored by the LME have fallen 57 percent this year to the lowest since August 2008. Nickel and lead climbed in London. Aluminum and tin fell. The gold price jumped around on Wednesday only to settle in familiar territory. On the Comex division of the New York Mercantile Exchange, gold futures for August delivery in late afternoon trade exchanged hands for $1,319.50 an ounce, down $1.80 from its settlement level in middling volumes. Earlier in the day gold touched a low of $1,305.40, only recovering after a drop in the dollar following a surprisingly large down adjustment in the first quarter US GDP. Last Thursday's nearly $50 an ounce surge in frenzied trading now appears to have been a blip as gold's momentum turns sideways. If successful it should be able to make further progress towards trend-line resistance at 1371 USD/oz ahead of the 2014 peak at 1392 USD/oz. However, a move back below 1300 USD/oz would remove the current momentum and most likely result in a renewed period of range-bound trading around 1295 USD/oz. which has been the average price for the past year. 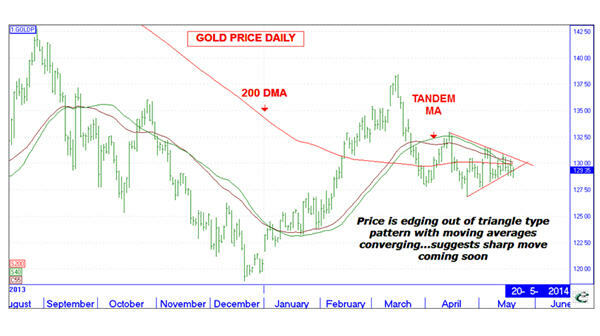 Towards the end of May, InvesTRAC produced a chart showing that the uncharacteristically quiet gold market was primed for break-out price move. That bust out if its trading range started out as a big gap down with the gold price hitting $1,244 at the start of June. That was before Yellen and ISIS changed the picture again and a 90 tonne 15-minute trade lit a fire under the metal. Following last night's 94-page extravaganza on gold, this infographic, part four in our 2014 Gold Series (part 1, part 2, & part 3 here), covers the five best reasons to own gold: 1) Gold helps investors diversify their portfolios; 2) Gold is a great store of value; 3) Gold helps protect against inflation and other risks; 4) Gold demand is driven by a growing east, while grades are dropping and new discoveries are more scarce; and 5) Gold stocks are as cheap as they have ever been, using the GDX as a proxy. 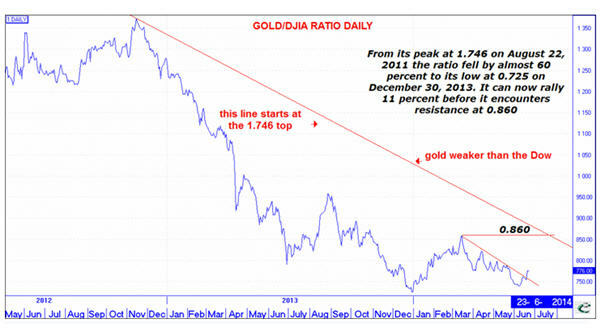 The reasons to own gold have not changed since the peak in 2011. US equity indices are showing signs that a pullback may be developing, Citi's FX Technicals group notes, as the S&P 500 Index, the NASDAQ Composite Index and the Dow Industrials Index all posted bearish key days yesterday. A short-term correction on the order of 3%-6% may be developing on the back of this. The Dow Transports Index, which has been the leading US equity Index this year, has already been showing signs of stress as well. The VIX Index is also turning higher from low levels and should head up towards at least 14% if not 18% if the pullback in equities materializes. The US S&P 500 Index posted a bearish key day at the trend highs yesterday. 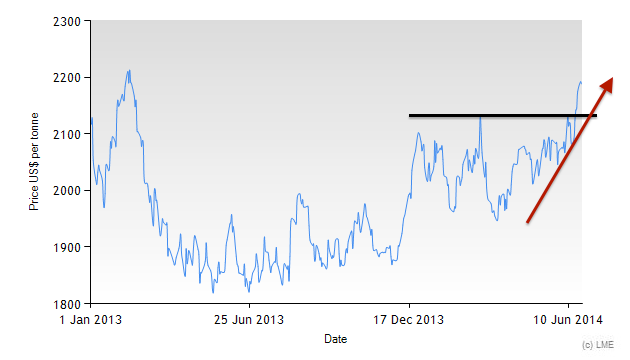 (The last bearish key day at trend highs back in April was followed by a high to low move of -4.4%.) Daily momentum also turned lower and negative momentum divergence has developed (though not triple divergence). A short-term pullback towards supports around 1920-1925, the converging channel bottom and recent low, appears likely at this point. A break below there then opens the way to good supports around 1900, which would result in a high to low correction of around 4%. At this point our bias is that a short-term pullback to the above supports would not be out of line within the overall trend higher (markets don’t move in straight lines after all). However, a deeper correction, which is not yet our base case, could see a pullback towards the 1814-1820 area (converging April low and 200 day moving average, which has not been tested since 2012). Other equity markets are also showing signs of stress. In equities or commodities markets, prices tend to rise or fall abnormally sometimes. In such circumstances, it is necessary to protect an investor from such sharp movements. It is here that ceiling or floor comes into play. Ceiling is applied when prices rise and floor comes into play when rates fall. An important other objective of the concept of ceiling and floor is to prevent excess volatility in a commodity. This leads to sharp price swings and lower volume, ultimately affecting liquidity in trade. In India, the Forward Markets Commission, which supervises the functioning of commodity exchanges, has termed the ceiling as daily price limits. It has fixed different limits for agricultural and non-agricultural commodities. 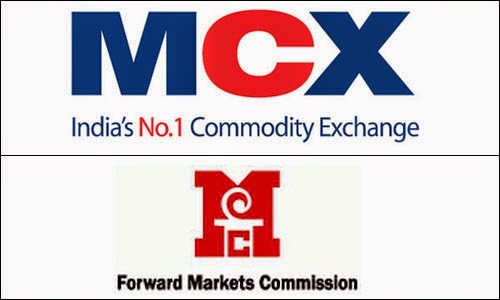 According to the norms fixed by the Forward Markets Commission, the limit for prices of agricultural commodities to either rise or fall is four per cent. Among non-agricultural commodities, the limit is four per cent for PVC and six per cent for steel. For other commodities such as energy products and metal, which are traded on the global platform too, the ceiling/floor is nine per cent. Even for the price limit, the commission has set a cooling period. For some commodities, this comes into effect the moment prices rise or fall by two per cent. In some commodities, considered as commercial crops, the limit is three per cent. The cooling period is for 15 minutes. After this, the prices cannot rise or drop beyond the set daily limit. For non-agricultural commodities, the cooling period come into play once prices gain or lose by four per cent (it is three per cent for gold). After that there are two more slabs of two and three per cent (three per cent each for gold) limit to hit the limit. According to the Ministry of Consumer Affairs, which keeps a tab on commodity exchanges, the daily price limit has been reached 4,746 times for various commodities between 2011 and April 2014. THE world's first exchange-traded, wholesale 25 kilobar gold contract, to be listed on the Singapore Exchange, is scheduled to start trading as early as September 2014, Lim Hng Kiang, Minister for Trade & Industry, said on Wednesday. In his opening address at the London Bullion Market Association (LBMA) Singapore Market Forum, Mr Lim said the World Gold Council (WGC), the Singapore Bullion Market Association (SBMA), the Singapore Exchange (SGX), and four leading bullion banks - JP Morgan, Scotia Bank, Standard Bank and Standard Chartered - will come together to create this physically deliverable contract. "With strong support from the Singapore Government, we expect this contract to commence trading as early as September 2014,'' Mr Lim said. He noted that the development was "timely" given the increased requirements for reference prices to be transparent. According to International Nickel Study Group (INSG), the surplus in global nickel market dropped significantly year-on-year during the month of April this year. The global nickel market surplus totaled 4,000 tons in April this year. This is 55.56% down when compared with the surplus data during April last year. The global nickel market surplus during April 2013 was 9,000 tons. 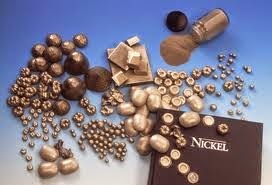 The nickel surplus in April increased when compared with the previous month. The global nickel surplus surged by 11% month-on-month during April. The production of Nickel during the month of March this year exceeded the monthly demand by 1,600 tons. INSG notes that that the global nickel surplus during the four-month period from January to April this year dropped significantly over the previous year. 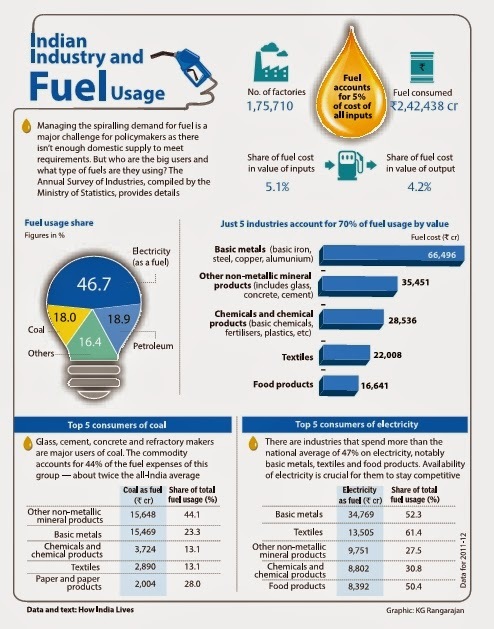 The surplus narrowed by more than 75% during the initial four-month period of the year. The global surplus of nickel dropped from 51,000 tons during January to April 2013 to 12,600 tons during the corresponding four-month period this year. Quietly behind the scenes, amid all the chaos of the Qingdao probe's contagion, copper has rallied modestly in the last seven days. That streak ended last night as the warehousing concerns we noted spreading to the entire sector, combined with a collapse in Chinese copper imports (down 17% in May), and yet another default (China Ting holdings said said two borrowers defaulted on entrusted loans). So it seems that not only are the commodities missing, but so is the money...as the slow motion train wreck gathers pace (no matter what PMIs or minis stimulus do to evade the tightening) as China's money-market rates (at 5 month highs) suggest liquidity demand is very high (and desperate). China’s imports of refined copper fell 17 percent to 282,969 tons in May, customs data showed yesterday, marking the first monthly drop since February. Inbound shipments could fall further as the Qingdao investigation may curb purchases from abroad by traders who use commodities as collateral to get loans, according to Ye Yonggang, an analyst with Jinrui Futures Co. in Shenzhen. “China’s trade data showed a slowdown in the country’s demand for metals, clouding the demand outlook,” said Kazuhiko Saito, an analyst at Fujitomi Co., a commodities broker in Tokyo. The country’s copper exports rose 31 percent to 28,149 tons, the highest since April 2013, customs data showed. Some copper may be moved from China to LME warehouses in South Korea, and possibly Singapore and Malaysia, according to Jeremy Goldwyn, head of business development in Asia at Sucden Financial Ltd.
China’s imports of zinc and lead also declined in May from a month earlier, customs data showed. China Ting Group Holdings, a garment maker, said two borrowers defaulted on entrusted loans it made through Ningbo Bank Corp. and Bank of Communications Ltd. The stock fell.